3 Bedroom Semi Detached House For Sale in Leicester for Asking Price £220,000. 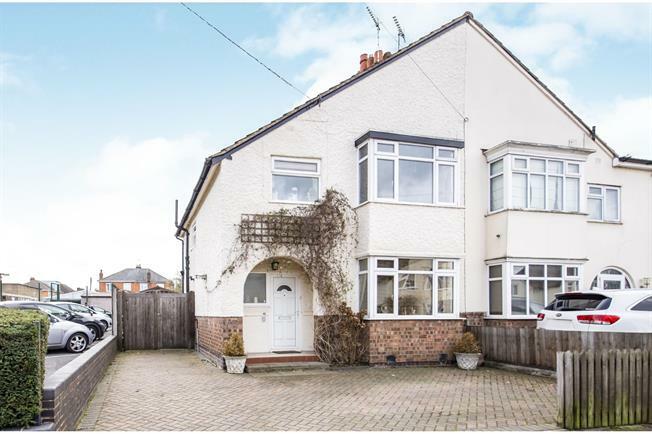 A perfect opportunity to purchase this fantastic three bedroom semi detached family home. Located on the popular road of The Crossways, sitting on a generous plot benefitting from large spacious rooms, double glazing throughout, and gas central heating. In brief the property comprises, an airy hallway giving access to all accommodation, lounge with bay fronted window, kitchen diner with access out to the garden, upstairs has three bedrooms, two of which have fitted wardrobes and a family bathroom. Externally offers off road parking for three cars, a large private garden with a unique work shop. This property is within walking distance to all local amenities and in good school catchment. An airy hallway giving access to all accommodation. Over looking the front elevation, bay fronted window and a featured fire place. Over looking the rear elevation giving access to the kitchen and leading out to the patio area of the garden. Over looking the rear elevation, Stainless steel sink, roll top work surfaces and splash back tiles. Over looking the front elevation, uPVC windows carpet flooring. Over looking the rear elevation, uPVC windows, carpet flooring and fitted wardrobes. Over looking the front elevation, uPVC windows, carpet flooring and fitted wardrobes. Shower over the bath, wash basin and low level W/C.